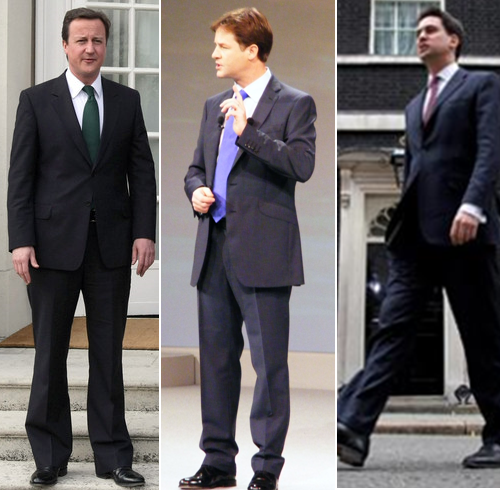 Three new political leaders displaying three approaches to wearing a suit. David Cameron, leader of the Conservatives, enjoys flared trousers. Nick Clegg, leader of the Liberal Democrats, likes his slanted pockets on his jackets. Ed Miliband, leader of the Labour party, presents polished white shirt cuffs which are (correctly) longer than his suit sleeves. Notably, all three wear single breasted, two button suits – the choice of style for being a political leader. See also: bespoke london tailor, Bespoke Shirt, bespoke suit, button suits, David Cameron, Ed Miliband, Henry Herbert, Henry Herbert Tailors, leader, leader of the conservatives, nick clegg, Savile Row, savile row tailors, suit, suit review, Tailored Suits. nick clegg Archives - Bespoke Suits By Savile Row Tailors.